Chubby Hubby Bars…or Fat Boys? 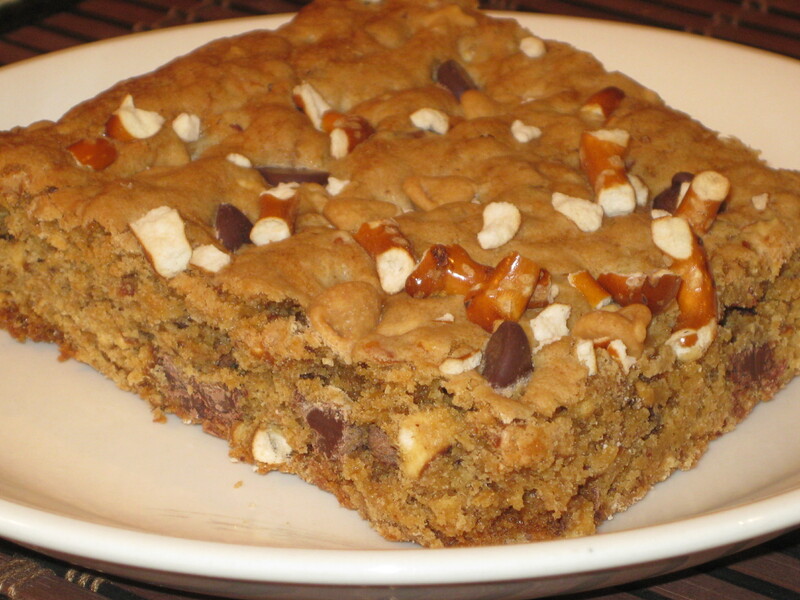 Let’s see… Chocolate chips, pretzels and peanut butter chips all smooshed together in a bar cookie? Yep, I’ve gotta try it! Easy to make and even easier to eat, these bars are basically a variation on a blondie. They’re not too sweet, so you can easily eat more than one. I’m not sure if that’s a good thing or a bad thing, so you decide for yourself! For me, they were more of a subtle addiction than an immediate obsession. You can easily kick up the chocolate chip quantity in this recipe, stir in some peanut butter chips, white chocolate chips, or chopped nuts if you want to. The more stuff you add, the chubbier the hubby, I think! Someone suggested we should skip the Chubby Hubby name and call them Fat Boys instead. Try them and see which name works best for your household! Click for recipe. These don’t take much time to throw together, and will travel well if you’re going on a road trip or to pot luck.